Xbox lanyard holder necklace, black with hook on the end, snap together hook. Xbox lanyard holder necklace, green with clip on the end, snap together hook and the black has a hook on the end. XBOX ONE X - Lanyard. We will respond to you within 24 hours. Xbox 360 Lanyard White. Condition is New. Shipped with USPS First Class Package. Xbox 360 Lanyard Green And White. Condition is Used. Shipped with USPS First Class Package. Xbox 360 Lanyard White With Clip. Condition is New. Shipped with USPS First Class Package. 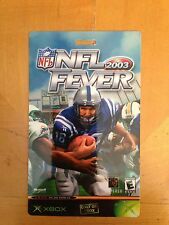 Was never sold was Issues as a Marketing Item. Very Rare! I only accept Paypal when purchasing, please pay through paypal if you choose to purchase. 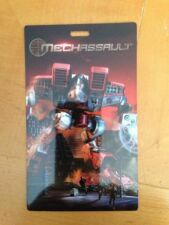 This is a lanyard released during promotional events such as PAX and Comic Con. 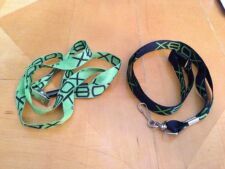 The Lanyard is in great condition and is great for fans of Microsoft or Xbox products. Comes from a smoke free home. Xbox 360 Gears of War Promotional Lanyard. Condition is New. Shipped with USPS First Class Package. PAX East 2019 - Xbox Bundle with Super Market Shriek and Game Pass Pin Lanyard. Condition is New. Please see photos for details Shipped with USPS First Class Package. XBOX ONE X Promo Launch, Rare, Green, Black - Lanyard. Condition is New. Shipped with USPS First Class Package. Brand new, never used. Make an offer! Don't wait for the auction! Please see pictures as they are part of the description. This item will ship USPS. U.S. Bidders with Paypal only. Please pay with PayPal when the auction ends. If you pay by 10:00 am the morning after the auction, your item will ship that same day. I ship Monday - Saturday unless the post office is closed for a holiday. I am a 100 % U.S. Seller from Louisana! Thank you for supporting my small business! I appreciate it! Gears Of War Lanyard XBOX 360 Promotional. Condition is New. Shipped with USPS First Class Package. Xbox One Promotional Lanyard w/ ID Holder Microsoft Promo Rare Item! 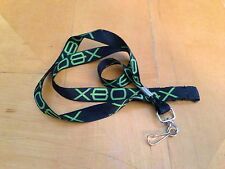 Up for sale is this very rare Xbox One Promo Lanyard with ID Holder. It is in good condition and was only used at one event. XBOX ONE X - Lanyard. XBOX ONE X - Drawstring Bag. XBOX ONE X - Socks. XBOX ONE X - Bracelet. We will respond to you within 24 hours. Xbox lanyard holder necklace, green with clip on the end, snap together hook. XBOX LANYARD PEN. PEN IS REFILLABLE. GOOD WORKING CONDITION. 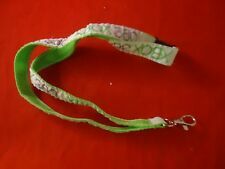 Xbox 360 Promotional Launch Lanyard *RARE*. Condition is New. Shipped with USPS First Class Package. God Of War Chains of Olympus Brand New never worn lanyard and Brand New Sealed Battle of Attica Demo Disc The lisitng is for 1 lanyard and 1 demo disc Please let me know if you have any questions about this listing Brand New Factory Sealed Battle of Attica Demo Disc (not the full game) Please see pics of description of game One side of the Lanyard features the God of War branding The other side of the Lanyard features the PSP branding Each lanyard is approx 24 inches long and 3/4 inches wide The listing is for the lanyards only, there is no game within this listing SUPER GIFT IDEA FOR ANY VIDEO GAME FAN AWESOME to Carry KEYS to the POOL PERFECT FOR SCHOOL or the GYM (HOLDS ID CARDS, KEYS, ETC) Thank you very much in advance!. New Official Microsoft Xbox 360 Promotional Lanyard Chain and Pins Promo RARE Paypal Only. Will ship to U.S. 48 States only, not Alaska or Hawaii. Bid with confidence! I have 100% FEEDBACK!